Give your dog groomer a Christmas gift to show how much you appreciate his or her services throughout the year. From cash tips to gift certificates and specialty items, a simple present offers an extra way to say, "thank you" during the holidays. If you're like many of us, you like to have your dog freshly groomed prior to having guests over for Thanksgiving turkey and all the trimmings. If that's the case, you may not visit your groomer again until after the holidays are over. This means if you're planning on giving your groomer a little something to express your appreciation, you might want to do it during this visit. Some people prefer to wait until closer to Christmas to squeeze in that final grooming of the year. If you fall into this category, then it's perfectly fine to wait until the Christmas season is in full swing before delivering a gesture of holiday cheer to the person that keeps your dog looking and smelling good all year long. It's also true that not everyone gives their groomer a gift at Christmas time, and there's no rule written in stone that says you have to. However, many people do like to show their dog's personal stylist a little extra appreciation around the holidays. If you're one of these people, then we have some suggestions that we think you and your groomer will like. Cash is a perfectly acceptable thank you gift for your groomer, and most groomers appreciate a healthy holiday tip. The question is exactly how much of a tip should you give? Traditionally, the groomer's holiday tip ranges from 1/4 to 1/2 the price of a standard grooming. If your dog is the easy "bath and a nail trim" type of canine, the size of your tip will be a bit less than it would be for another client who has a Poodle that requires a sculpted clip in addition to regular services. In the end, let your conscience be your guide. Tip your groomer whatever you feel he or she deserves for the level of service rendered over the past year. Perhaps you feel that an actual gift is more personal than a tip? Gifts are a great option, especially if you put some thought into selecting something your groomer can really appreciate. Here are some ideas that make wonderful Christmas gifts for dog groomers. If one of them isn't exactly your cup of tea, perhaps it will at least spark more shopping ideas. A gift certificate to a grooming supply website or catalog can be a much appreciated gift for any groomer. Groomers are always in need of new clipper blades, scissors and other equipment. Your gift can be applied toward any of these needs. A gift certificate doesn't necessarily have to be for something dog-related. You can give your groomer a gift card to a nice local restaurant, or to his/her favorite place to shop if you can find out where it is on the sly. It's hard to go wrong as long as you put some thought into your choice. Consider the kind of work your groomer does all day long. Much of the day is spent bent over a tub or a grooming table, and this can be hard on the back. A form fitting back pillow with optional heat and massage features can be just the thing to help your groomer feel better after a long day at the shop. The price on these pillows usually runs around $25.00. They're quite reasonable, yet they are still a useful and thoughtful gift. Your groomer's feet are probably also sore and tired. A nice pair of cushy slippers or even a set of high quality sole inserts can show you care. Groomers are usually quite busy and typically don't get a lot of break time throughout the day, so they often keep a beverage near their station. The problem is that floating dog hair often winds up in open mugs and cups. Most groomers are resigned to fishing the fur out and carrying on with business as usual, but a travel mug with a lid does make a nice gift in these circumstances. In a similar vein, you might also choose to give your groomer an electric mug warmer to help keep his or her coffee toasty warm between those quickly stolen sips. When in doubt, a cookie or muffin basket also makes a nice holiday gift for your groomer as long as you take care to find out if he or she has any dietary restrictions. 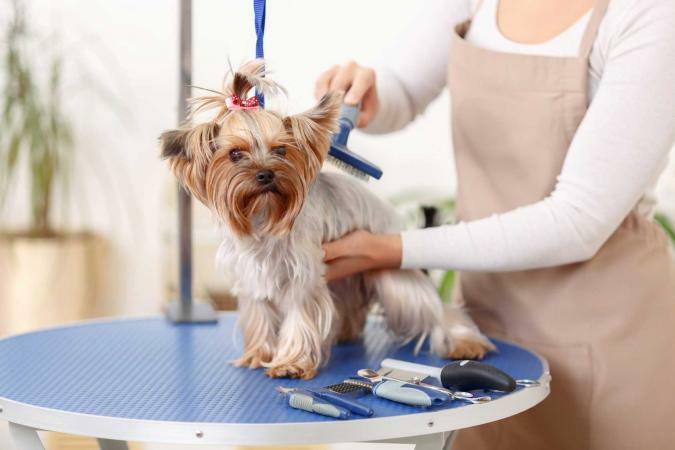 This is usually easy enough to find out through a quick discussion with the shop manager or receptionist once your groomer takes your dog back into the grooming area. Now that we have you thinking, you probably have even more ideas of your own about great Christmas gifts for dog groomers. Just remember, that old saying, "It's the thought that counts" still rings true. No matter how much a gift costs, it's not truly appreciated unless it suits the person receiving it.